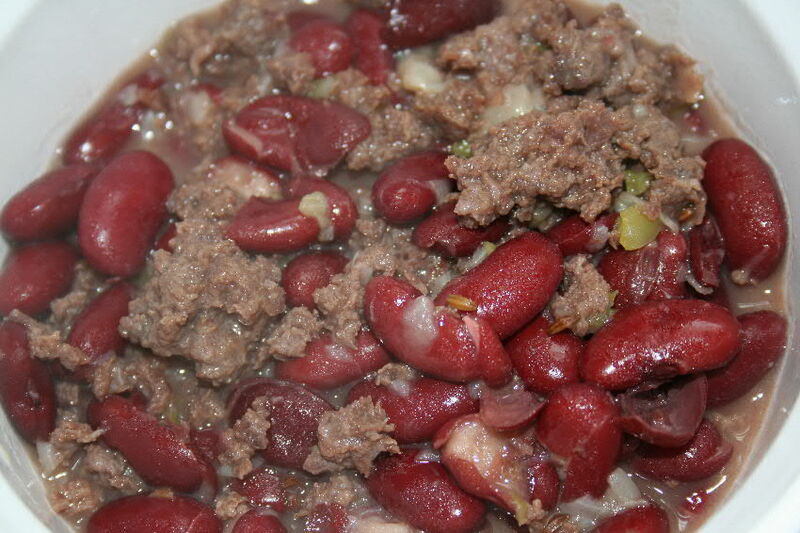 Black bear and red beans is a fast-cooking bear dish using canned beans and Italian bear sausage. On cross-country hunts I usually grind meat and make sausage before starting home. On my last Spring hunt in Idaho I did not have time, as I had shot the bear the day before I had to leave. In one day it was as much as I could do to remove the hide, get it to a taxidermidst, cut, package and freeze the meat from this medium-sized bear. When I cut the meat I made one meat package from each of the two forelegs and shoulders. The leg and shoulder muscles were too thin to make a roast. After I returned home, I ground it and made fresh Italian sausage to cook over the next few days. Then I cut a medium Spanish onion in a heavy pan, put in a quarter of a bell pepper and started to brown that with a teaspoon of margarine. Then I added a heaping cup of the lean bear sausage, browning and mixing the sausage with the onions and pepper. Following this I put in two 14-ounce cans of red kidney beans and chipped in about two tablespoons of low-fat mixed white and yellow cheese. Filling and empting the two cans with water into the pot, I sturred and allowed the mix to cook for about 1 1/2-hours. The result was very good. The butter and cheese added just enough fat to the lean Spring bear meat to “smooth” everything out on the pallet while the carraway seed, peppers, salt and oregano in the Italian sausage spice mix gave the product a small amount of heat. Like most such things, the “Bear and Beans” were even better on following days. I have more recipes for black bear meat in older blog posts and in my books, Backyard Deer Hunting: Converting deer to dinner for pennies per pound and Crossbow Hunting. More information on my books may be found at www.hoveysmith.com. Videos on the bear hunt, cleaning and transporting the bear were posted during May, 2010, on my blog, and there are links on my Blog http://www.hoveysmith.wordpress.com to these as well as to longer YouTube videos.